Industrial Grade Wireless Remote Power Switch accessible over your WiFi Network. Obtain IP address via DHCP: This allows the WiFi remote power switch to automatically obtain a IP Address from the DHCP server. Use the following IP address: You can also enter the IP Address information manually by selecting this setting. Telnet: Enable or Disable Telnet Access to the RPS-NODE-9258-WiFi. Once logged in by Telnet, type HELP for a list of commands that are available. DHCP Clone Mac: The clone Mac section allows you to clone a Mac address. This setting is usually used when a Mac address is blocked by the ISP. By cloning a Mac the device can still be accessed through the internet. Operation Mode: Allows you to select from Infrastructure or Ad-Hoc Mode. SSID: Type in the ID of the Wireless Network for your connection. Authorization Type: There are different kinds of Authorization types. For the RPS-NODE-9258-WiFi the 2 types are Open System & Shared Key. Encryption Type: NONE or WEP Encryption are the available choices. Default Key ID: The default key ID for connection to your wireless router. 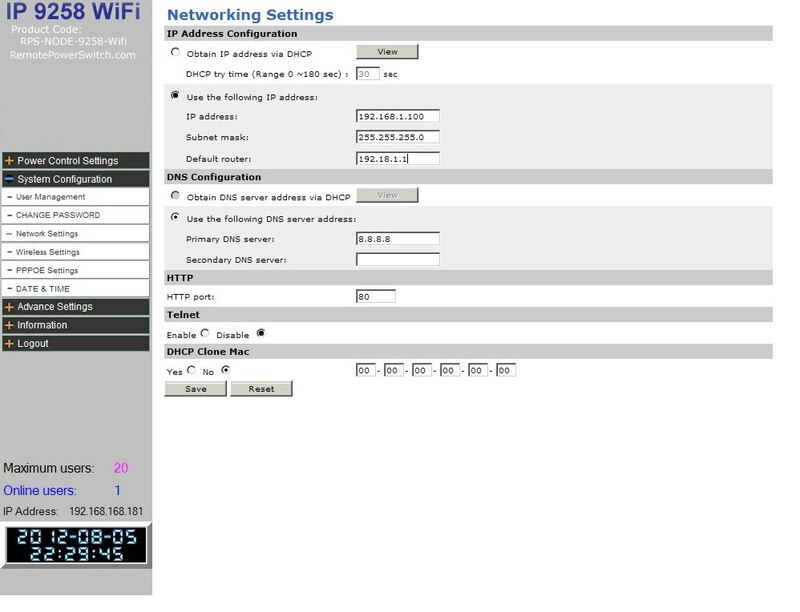 WEP Key ID 1-4: You WEP Key ID is the password being used to connect to your router. If E-mail notification is necessary when IP has changed select Yes.